TripAdvisor - OVR's Timber Ridge-Gorgeous Lodge located ON the GAP Trail in Confluence! Private Outdoor Pool (Unheated) - OVR's Timber Ridge-Gorgeous Lodge located ON the GAP Trail in Confluence! 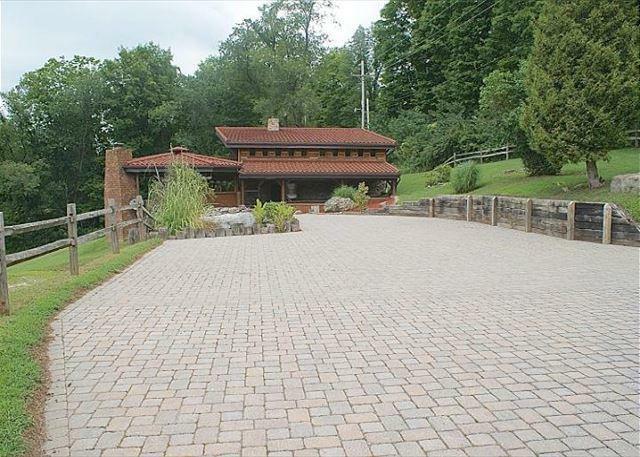 Revel in the beauty of the Laurel Highlands at this amazing property located directly on the Great Alleghenies Passage (GAP) Trail. Stocked pond, plenty of outdoor space, swimming pool, Event Barn on property, outdoor hot-tub, beautiful wood & stone accents are just a few of the things you can expect when staying at the Timber Ridge Lodge. Spend a summer evening under the pavilion with a crackling fire in the outdoor fireplace, or lounge in the sun on the beautiful wooden decks. A great place to host an intimate wedding, family reunion or retreat, and close to everything the area has to offer! From the Yough Lake to Ohiopyle State Park, local eateries and entertainment, Timber Ridge Lodge is your destination for a great getaway! Under new ownership, currently being renovated and refurnished for the 2016 Season! *WEDDINGS- We do have an event fee for weddings. Please contact us at 1-877-574-STAY for details. Additional amenities include: deck chairs, outdoor stone oven, fishing pond.